Whether it’s a kickoff workshop to align the team and develop a game plan or an ideation session to come up with creative solutions after a round of user research, we find ourselves running a lot of workshops here at Traceable Change. Based on our collective experience, we thought it would be fun to share some of our tried and true tips for creating and running a successful workshop. It’s important to know exactly who’s attending your workshop so that you can cater the information and activities to them. For example, the way you structure a workshop for a group of designers may be vastly different than what you would do for a group of high level executives. The larger the group, the harder it is to ensure that everyone is actively engaged in the workshop (and not responding to emails on their laptop). Typically, a good goal is to have no more than 20 attendees. Even then, plan to break people out into groups of no more than 5-6 for hands-on activities. Knowing your audience also comes in handy here, as it’s useful to assign groups ahead of time. 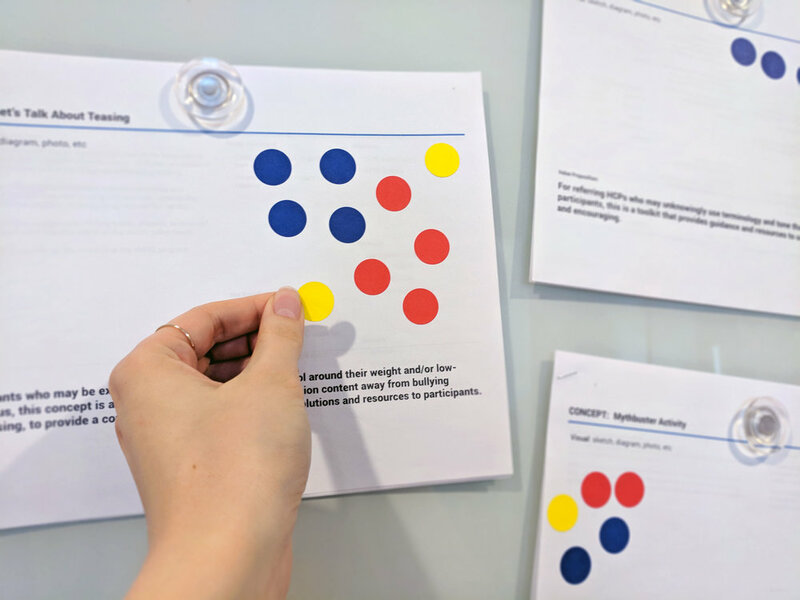 This minimizes time spent choosing groups during the actual workshop and also allows you to ensure each group is well-rounded in terms of background knowledge, skills, and personality types. Planning and structuring your workshop ahead of time cannot be overstated. To make the workshop run smoothly, you’ll want to spend time thinking through exactly how you want the workshop to unfold, including how you’ll start and end the day, each activity you’ll complete, and how you’ll transition from one activity to the next. As you’re planning the workshop, it also helps to start with what you want to walk away from the workshop with, and then design backwards from there. This ensures you’re always focused on and working towards your overarching goals. Although workshops and design activities are becoming more commonplace, don’t assume your attendees have prior experience. Often times, you’ll need to provide some guidance on how to participate and flex their creative muscles. One of the best ways to do this is to present them with a few initial examples of what you’re asking so they can better understand what’s expected of them and have a jumping off point. As groan-inducing as icebreaker and warm-up activities can sometimes be, they serve a really important purpose. Similar to modeling activities, these are a great way for attendees to get their creative juices flowing and enter the right mindset (be it sketching, brainstorming, collaborating, etc.) before launching them into the actual content-related activities. One of my favorite activities to prime people for a brainstorming session involves having them list ways that kittens are like refrigerators. I love this exercise because it shows how many ideas you can come up with when combining two seemingly unrelated things and helps get people thinking creatively. Plus, kittens! Attendees should know what’s expected of them and what the overall goal of the workshop is right from the start. Having a shared vision will help keep everyone on task and (hopefully) minimize tangents and unproductive side conversations. As mentioned before, many of your attendees may be new to brainstorming and other design activities. There are some standard ground rules that are helpful to set (one conversation at a time, withhold judgement, etc.) to help make sure people are on the same page with how to be a good participant. It’s also good to create some new ground rules together. These can be related to things like overall workshop goals, user needs, or attendee behavior. As consultants, we find this especially helpful as it gives us a better sense of the company culture, including what’s important to them and how they work together as a team. In addition to clearly defining the workshop goals, it’s important to kick things off by actually bringing people into the problem space and presenting tangible, data-driven evidence. Our favorite way to do this is through user research findings, because it helps keep users top of mind and ensures no one has to guess what it is that users might want or need when making decisions. However, if research findings aren’t available, there are usually analytics or other secondary research that can serve a similar purpose. Taking the time to ensure everyone has a shared vision of the challenge at hand will not only better establish the purpose of the workshop, it will ultimately result in a greater output. Even though you’ve spent time developing the agenda and planning out all the activities, things won’t always go exactly as planned. A good facilitator is similar to a good DJ - they should be able to read the mood of the room and improvise as necessary to keep things moving. For example, one activity I like to keep in my back pocket for when attendees are having a hard time making decisions is dot voting. This is a quick, effective way to come to an agreement and move forward without having to waste time and mental energy on a debate. Being able to improvise activities as a facilitator is something that becomes easier with experience, but don’t feel discouraged if you’re just starting out! There’s a myriad of great resources out there to help you build a strong activity library. Workshops can be exhausting; they require a lot of mental energy and focus, so building in multiple breaks throughout the day helps sustain everyone’s energy. Additionally, this helps prevent people from checking email or doing other work during the actual activities, as they have a designated time to do those things. Depending on what you’re trying to accomplish, it may even be a good idea to break a workshop out over multiple days instead of trying to cram everything into one really long day. This also has the added benefit of allowing attendees to absorb and the information and reflect on it, so they come back the next day refreshed and even more focused. My general life motto is that there’s no problem a warm cookie can’t solve. So heed my advice and don’t forget to fuel your attendees with treats! Workshops are a big time commitment and it’s often a struggle to get all the right stakeholders in the same room at the same time. As a facilitator, it’s your job to make participants feel like their attendance was worthwhile and they’ve made a good investment with their time. The best way to do this is by ending the workshop with an outline of actionable next steps and a follow up plan. Remember, the workshop isn’t the end goal, it’s simply an important part of the problem-solving process. Always keep a clear view of goals, outcomes, and next steps, and you will have a successful and fruitful workshop experience! Go forth and facilitate, friends. You’ve got this! Jillian Larson is an experience designer and strategist at Traceable Change. In addition to rallying folks for some fruitful ideation, Jillian can be found eating her way through Chicago and hanging out with her cat.